I withdrew $100 in pennies, nickels, dimes, and quarters from my bank account last week. 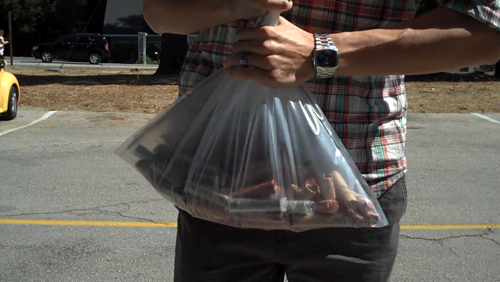 I walked out of the bank holding a plastic sack full of change, feeling like some kind of underachieving bank robber. I did this because I live in mortal terror that if I ignore the WCYDWT fairy even one time, she will leave me for another math teacher and whisper interesting ideas in his ear. For this reason, I put her ideas into some kind of play as fast as I possibly can. I was just thrilled she didn’t tell me to literally rob the bank. I mean, it’s conceivable. Reminds me of a penny “diffusion” lab I did with my chemistry students. Students analyzed over 3,000 pennies, comparing mint marks and year. We were able to see a trend that the most recent pennies had a higher percent of local mint marks, but as the pennies got older, the percentages were getting closer. I know that fairy and I have the same fear. You just have to do what she says when she whispers in your ear. I do believe there’s a TED talk about that fairy. @Lee, wow, awesome idea. Tagging that. Finding your blog I am inspired and wish that I had a WCYDWT fairy of my own. I see this picture and begin thinking of weight problems with my pre-algebra students. If pennies weigh…, nickels weigh…, dimes weigh…, and quarters weigh…, if have 2 pounds of coins what is the most money I can I have? I see this problem with variations for days. I love the idea of taking any old picture and finding things to do with it. I am a first time reader to your blog and am inspired by your picture. I have been searching long and hard for a new way to teach mathematics and you have shown me the way. I am interested to take this back to my fellow math teachers to see what ideas they can come up with. I am the proud keeper of a SMART board and a projector and apparently am doing it a disservice by not using more pictures and visuals. This will be wonderful for my students, as we have just finished reviewing decimals. I believe I’ll be asking them of the possible combinations that can be in this bag if there is $100. Thank you!! What does WCYDWT stand for? Rob the bank. Rob the bank. Rob the bank. @Jinna, what can you do with this? This picture makes me envision a fairly sophisticated lesson on place value. The coin has a value in cents. The roll has a value in coins. The bag has a value in rolls. for a challenge even multiplication. I teach middle schoolers and I tire of watching students using long division to solve 350/10. Maybe by having the students work with a totally bizarre number system for a couple of days followed by a review of the base ten system they will come to a better appreciation of place value and the simplicity that comes for free with the base ten system. You might want to include the face in the shot so that they are certain that the bank robber is their teacher. Maybe that would be better accomplished with a pre-lesson video of the robber running out of the bank. Using pennies as “standard” weights in an activity gathering (somewhat) linear data in an activity exploring Hooke’s Law, we discovered that not all pennies are created equal. We noticed that different teams were getting significantly different data and went back to our experimental design to determine the reason. We discovered that some pennies were heavier than others and after research discovered that the composition of copper pennies had changed. In mid 1982 the Lincoln penny changed from 3.11 g to 2.5 g. What a serendipitous event!